Last year, I wrote a review of Medi-Share from my perspective as an insurance professional. This year, I want to share my experience as a Medi-Share member. With major medical premiums rising and doctor networks shrinking, I found myself in the same situation as many of my clients: how do I afford this and keep my family covered? 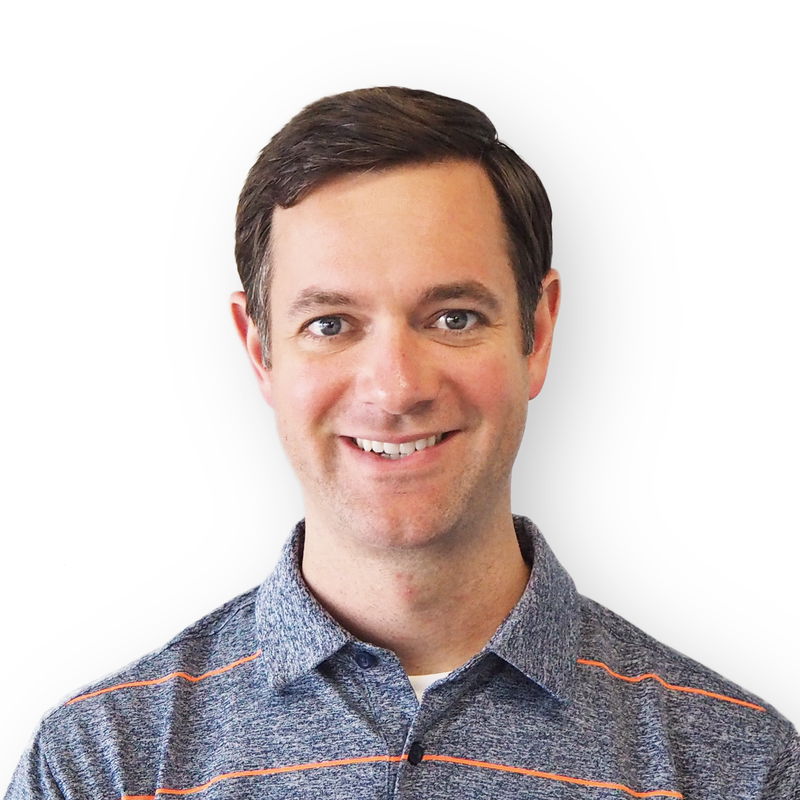 Medi-Share appeared an attractive option: lower premiums, a PPO doctor network that my wife's OBGYN and kids' pediatrician was on, a really cheesy website (it's gotten a little better), and lower premiums (did I say that already?). But how would it actually work? We were expecting some major changes too--my wife was pregnant and we were expecting baby boy #3 during the summer. Would this really be a good option for us? If you're looking for a quick summary, here it is: Medi-Share is a fantastic option but there's a little bit of a learning curve involved. Once you get the hang of it though, I think most individuals and families will be pleased. You can jump right into our website to compare Medi-Share to other plans in your area, or continue reading to get the details. Medi-Share does not exclude people for pre-existing conditions (similar to major medical plans), but they won't pay for any pre-existing conditions for the first 36 months. Very important! For our family, this meant my wife was not a good candidate since she was already pregnant when we were signing up. We decided to leave her on the major medical plan we had before (Aetna) and move me and the then 2-year-old twin boys onto Medi-Share. My wife and new baby would move over with us after the baby was born (more on that decision later). Signing up was easy, but a little different than the other insurance companies (remember that learning curve thing I mentioned?). Once you apply to Medi-Share, you're not automatically enrolled. There are a few more forms and signatures you need to complete about your medical history as well as sign a statement of faith and provide some church references. No one ever checked our references but we have had clients tell us that their's were. You also have to set up your sharing account with the bank. There's a small fee and some paperwork involved, but overall pretty painless. There's no Open Enrollment requirement for Medi-Share meaning you can sign up anytime, but they recommend you submit your initial application by the 20th of the month if you want your plan to start the 1st of the next month. Makes sense based on our experience--it took about a week. Most of the time, your doctor's front-office staff will not have heard of "the Medi-Share network", so don't panic if you ask and they look at you funny. Medi-Share uses the "Multiplan PHCS network". They'll likely nod their head if you ask about that. The biggest difference with Medi-Share was figuring out how billing works. It was a little confusing at first, but after you get the hang of it, I think it's actually much more straightforward than other major medical plans. With Medi-Share, there are no deductibles or max-out-of-pocket limits, just this thing called an Annual Household Portion (AHP) that is kind of like a deductible and max-out-of-pocket limit rolled together. 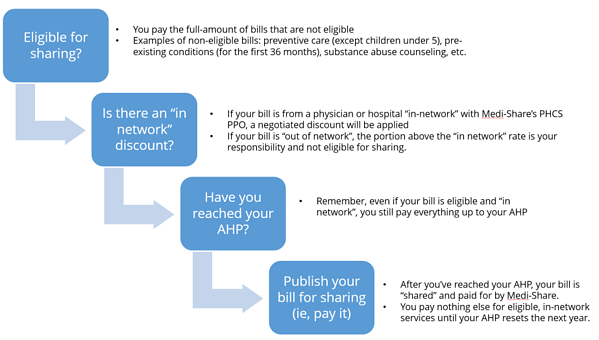 In real simple terms--you pay everything before your AHP, and then nothing after your AHP (for eligible services, more on that in a second). Medi-Share also doesn't have co-pays for doctor visits, they have a $35 "provider fee". You pay this fee everytime you see a doctor (primary care or specialist). It does not count towards your AHP but does go towards your doctor bill. Most people will never know the difference, but as an insurance insider, here it is: Say your doctor charges a $100 fee for a 15 minute consultation. If your plan has a $35 copay, you would just pay $35 and your insurance would pay the rest. With Medi-Share, you pay the $35 provider fee and then get a bill later for the remaining $65 (which does go towards your AHP). Not a huge deal as most people will probably never notice, but something to point out. Is there an "in network" discount? --> Assuming you went to a hospital in Medi-Share's network, you would get the negotiated rates. Let's say the cost of your hospital stay is $8,000, but the negotiated rate is $6,000. The hospital will send your bill to Medi-Share and they'll apply the correct rates for you. Have you reached your AHP? --> If this is the first bill you have, then no, you haven't. If you're on the AHP 2500 plan, you pay $2,500, and then the remaining $3,500 is published for sharing. Any other eligible bills you or anyone in your family have that year are covered since you've met your AHP. In summary, your $8,000 hospital bill costs you $2,500 out-of-pocket. Not bad! And much more simple than trying to figure out your deductible, coinsurance, and copays on a regular medical plan. My wife and I welcomed baby boy #3 this July. I mentioned I left my wife on our old Aetna plan while she had the baby since we weren't enrolled in Medi-Share before the pregnancy and thus it would have been excluded from coverage above (would have failed question #1). That was a good move. I then moved my wife and new baby over to Medi-Share to save money (they Aetna premiums were crazy high). That was a medium-good move. I'll explain. I had read in the Medi-Share guidelines that preventive care was "eligible for sharing" for newborns and kids up to 5 years old. This was good because our new baby was about to have all of his newborn check-ups and immunizations, all things that are considered preventive and covered for $0 with a major medical plan. Not so with Medi-Share. I got a bill for nearly $1,000 for my baby's immunizations! Going back to the chart above, just because preventive care for kids up to 5 years old is "eligible for sharing", doesn't mean it won't cost me something. It was eligible for sharing (passes step 1), the in-network discount was applied (step 2), but I had not reached my family's AHP yet (step 3) so I got a bill for the immunizations. It makes sense in retrospect, but was a little unexpected. As a side note, I submitted the bill to our new negotiation service with Take Command Health--they called the pediatricians office and worked with Medi-Share to get a few hundred dollars knocked off for me. Not bad! I've also since learned that you can get immunizations for children pretty cheap at the county hospital--I've had some more experience Medi-Share parents recommend paying for the doctor visit with your pediatrician and then go to the county for immunizations. At first, I was kicking myself for not leaving my new son on the old Aetna plan for another month or two where his newborn checkups and immunizations would have been $0. However, Medi-Share sets their premium rates for singles, couples, and then families of 3 or more. With 5 people on our Medi-Share plan, I wasn't going to save any money by leaving one kid or even my wife and kid on Aenta. So long story short, I still came out way ahead with the cheaper premiums on Medi-Share but was caught off guard a little bit by the immunization bill. Medi-Share's customer service has been great. They often pray for you when you call too. At first I thought it was strange over the phone, but the account managers really know their stuff and keep up with you and your family. We haven't crossed our AHP yet to have our bills shared, but we regularly get postcards to pray or write notes for other families that have. They don't disclose why (that would be a privacy violation) but it's still pretty cool. Medi-Share recently added some basic ancillary products including telemedicine with MDLive and a dental discount program with Carrington. These are automatically included in your monthly share amount. Telemedicine is a smart move because instead of paying the $35 provider fee, you can call and get basic prescriptions over the phone for $0. However, I'm really glad I used Take Command's Premier membership plan in combination with Medi-Share. Although our telemedicine provider Teladoc and MDLive are admittedly a little redundant, Take Command's dental network with Aetna was much larger and had our dentist while the Carrington network did not. Also, the bill negotiation service paid for itself with the money it saved me on the first bill. Full Disclosure: Yes, we made a small margin when you sign up for Take Command's Premier membership plan, but I found it to be worth it and a nice complement as a Medi-Share member. We'll be continuing with Medi-Share this next year and would highly recommend it! As I mentioned, there is a little bit of a learning curve and I'm really thankful I had our bill negotiation service at my disposal to help. Although the immunization bill caught me by surprise, now that I understand Medi-Share's billing process a little better things like that won't surprise me. When you factor in what we're saving on premiums each month, we still come out way ahead on Medi-Share than we would with a major medical plan. If Medi-Share is consistent with your values and faith, I think it's worth a serious look. If you're eligible for a tax-credit or have a costly pre-existing condition, I would make sure to weigh your other options before signing up. The best thing to do? See how Medi-Share compares to other major medical plans in your area by going through our self-guided interview at TakeCommandHealth.com. As far as we know, we're the only website that let's you compare Medi-Share side-by-side with Marketplace and off-exchange major medical plans in your area. Use our free site to quickly search for your doctors and prescriptions and simulate your conditions to see if Medi-Share would be a good fit for you and your family. And of course, if you have any questions, feel free to ask in the comments below or email me at support@takecommandhealth.com and I'd be happy to answer your questions! Note: Medi-Share does not pay commissions like typical medical plans, but we do make a small marketing fee when users sign up through our site. It keeps us in business and does not cost you a penny. Is Medi-Share right for your family? Compare Medi-Share to other major medical plans in your area.